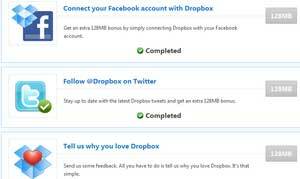 Dropbox is one of the best file sync and file sharing application available till date. The program supports multiple platforms and thus can be used to sync files, folders and documents from Windows, Linux, MAC computers and also from various mobile devices. If you are new to Dropbox and haven’t tried it yet, we suggest you read our earlier article on how to make the most out of Dropbox. Dropbox gives 2 gigabytes of free space to all users which is sufficient if you want to sync only a few folders between multiple computers. However, the 2 GB limit is not enough if you want to sync or backup a large collection of music albums, MP3′s, video files etc. 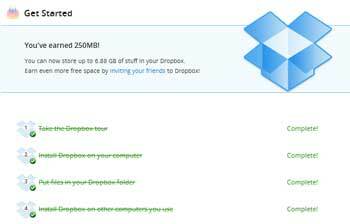 In this article, we will learn some tricks to increase Dropbox storage space, all for free. Once you’ve completed five of those things, you should see an extra 250 MB of space show up in your Dropbox. If you’re a Twitter or Facebook user, you can get up to 768 MB of free space by performing a few simple social media-related tasks on Dropbox’s “free” page. Most of them are quite simple—connecting your Twitter and Facebook account to Dropbox, following @Dropbox on Twitter, sending them a one-line feedback message, and tweeting about Dropbox to your followers. With the exception of the last one (which we’ll come back to in a moment), they’re all very easy things that will take just a few minutes to do. This is the big one. The best way to get extra Dropbox space is to send your referral link to others, which, after they sign up with it, will give you (and them) and extra of 500 MB of space in their accounts. So, if you get two people to sign up for Dropbox using your referral link, that’s an extra gigabyte for you and you can earn up to 16GB this way. There are a few good ways to go about this (without getting spammy), and you can seriously increase your space with just a few choice words and link. Keepass isn’t nearly as user fneirdly or well supported as RoboForm. RoboForm actually offers live U.S. based phone support. Can’t even get an email from Keepass. Don’t even get me started on the lack of security in Drop Box, I personally have used GoodSync ever since Drop Box allowed users to log into any account without a password for multiple hours. Google the headlines, you probably won’t be using Drop Box much longer either once you see how insecure it is.